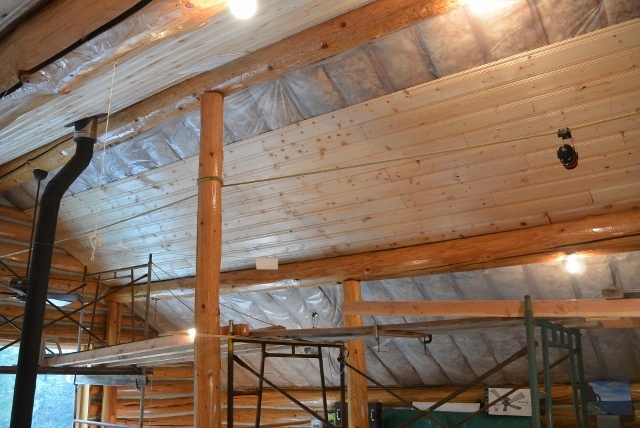 The objectives for 2015 were to finish the installation of the ceiling boards, to backfill the open water line trench, to finish the logging activity, and to make some progress finishing the exterior log staircases. 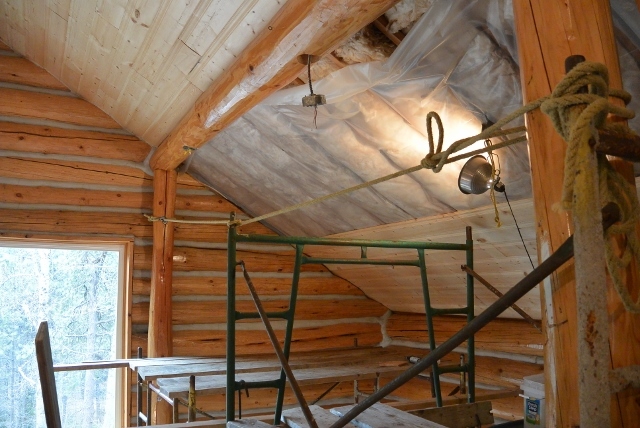 The ceiling boards and the waterline and trench were completed. 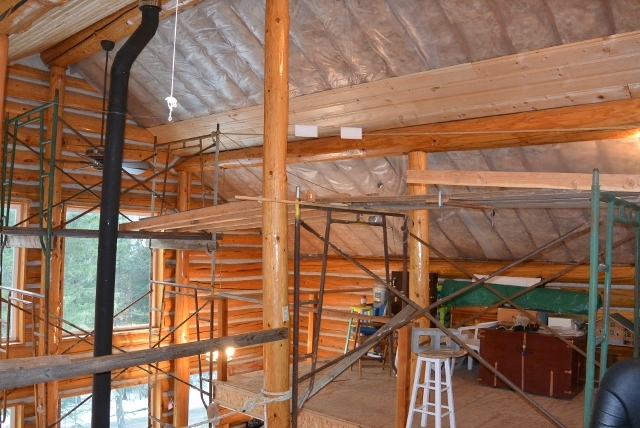 Half of the logging was completed, and all the final treads were installed on the front porch staircase. It was a successful year. 1/8/15 The scaffold has been reconfigured under the Grid B1-C3 bay. 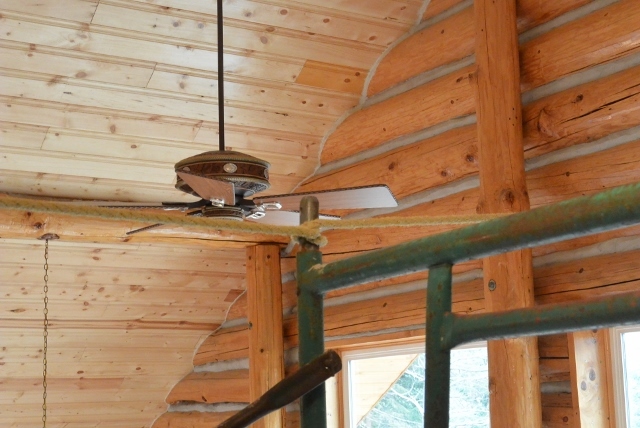 You can barely see the fan blades interleaved between the 3rd-tier cross brace behind the stovepipe. 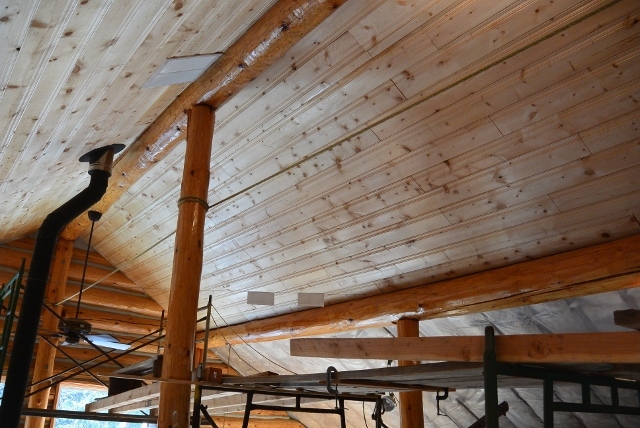 You can also see the first four courses of ceiling boards are in place just above the Grid B purlin. 1/8/15 Here you see the Grid 1 end of the scaffold supported by two ladders against the gable wall. 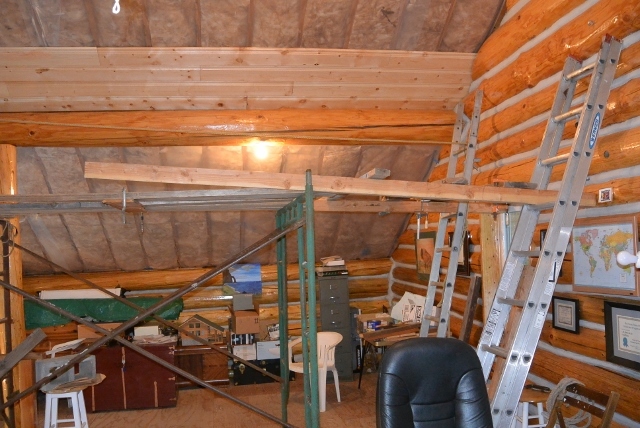 1/23/15 The ceiling boards are closing in on the ridgepole. 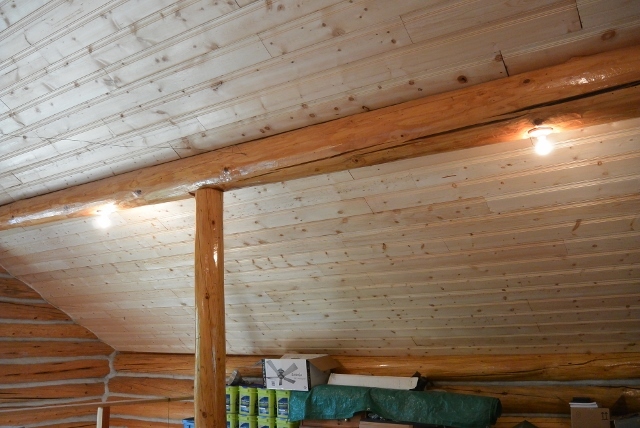 2/12/15 The ceiling boards are finally complete up to the ridgepole for half of the Grid B1,C3 bay. This is the view toward the Grid 3 gable. 2/12/15 This is the view toward the Grid 1 gable. 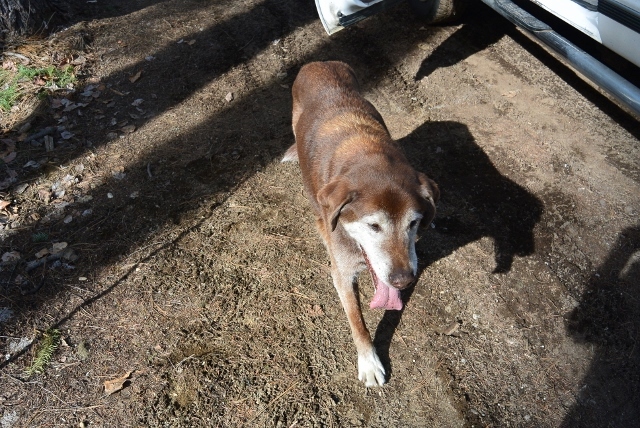 3/10/15 Ernie is looking pretty old but he still gets around. 3/10/15 He enjoys his biscuits. 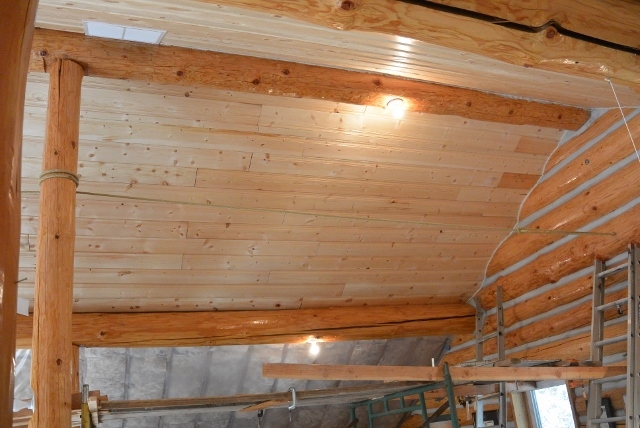 3/19/15 In this picture you can see the safety rope and the progress to date on the last section of ceiling boards. 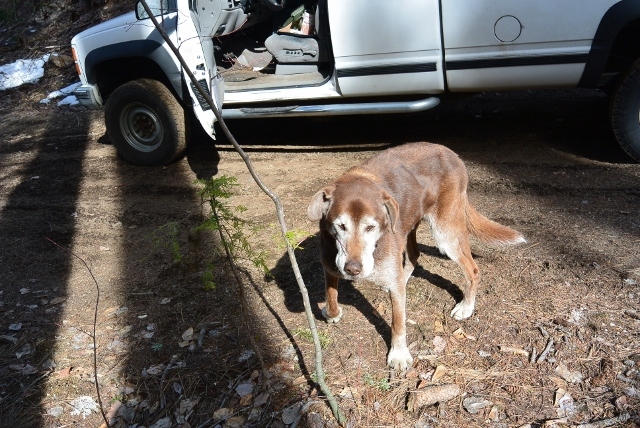 3/19/15 Here is a close-up of the Martin's Differential Hitch used on the safety rope. 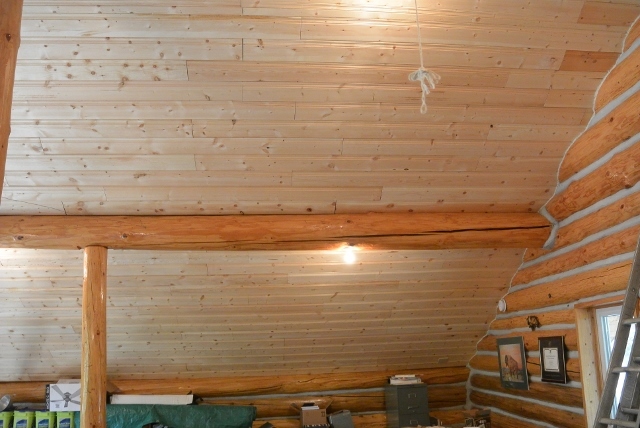 4/16/15 Here is the finally finished ceiling viewed toward the Grid 3 wall. 4/16/15 And here it is viewed toward the Grid 1 wall. The ceiling job is finally finished after all those years! ©2015-2019 Paul R. Martin, All rights reserved.